LENTY OF discussion has taken place within the Church over recent years on the topic of marriage. Some of this discussion was occasioned by the new English translation of the marriage ritual (published in 2016). Certainly much of the conversation has also been prompted by the 2014-2015 extraordinary synod on the family and Pope Francis’ post-synodal apostolic exhortation, Amoris laetitia (2016). Recently, my research interests took me in the direction of marriage, also. I decided to study a host of liturgical rites for marriage throughout history in order to assess their approach to the relationship between husband and wife. In particular, I looked for evidence of rites that stress mutuality between spouses versus rites that stress the headship of the husband. The result of my research is an article published in Antiphon: A Journal for Liturgical Renewal (vol. 21, no. 3, 252-289; full article available here). Antiphon is the journal of the Society for Catholic Liturgy, which bills itself as a multidisciplinary association of Catholic scholars, teachers, pastors, and professionals (including architects, musicians, etc.) that promotes scholarly study and practical renewal of the Church’s liturgy in the Anglophone world. The title of my article is Mutuality and Male Headship: Liturgical Evidence from Marriage Rituals throughout History. 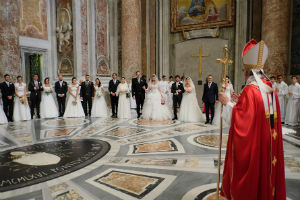 It begins with consideration of the marriage rituals of the Roman Empire and Judaism before proceeding to those of the Christian East and West. As I have noted elsewhere, the marriage rite has historically proven itself to be very adaptable. This exploration of so many marriage rituals revealed to me anew the great richness of the Church’s liturgical theology on marriage. Access the full articles by becoming a subscriber to Antiphon or by requesting single issues of the journal here. 1 David M. Friel, “Mutuality and Male Headship: Liturgical Evidence from Marriage Rituals throughout History” Antiphon 21, no. 3 (2017): 287.